OK, one last “Roll Call”-type image. Then I promise I’m done. These characters are from one of my favorite finds from my stay in Tokyo: a book from the Sixties or Seventies that is barely discussed called Fuuten, which roughly translates to “Bums” or “Homeless,” but I prefer “The Unwanted,” “Nobodies” or “Riffraff.” Shinji Nagashima’s pen and ink work is still stylish as all get-out today. Culturally and stylistically, I think it’s fair to say he is Japan’s R. Crumb, but I would not be surprised if he beat Crumb to the punch. His wonderful cartoons even amble around in a spread-legged gait that reminds an American audience of “Keep On Truckin’.” I am also not exaggerating in the slightest when I say the two volumes of Fuuten I am proud to have in my collection has had more effect on how I think of the potential of comics than anything Crumb has ever done. Did I just lose my indie comix cred card? Look at the spreads I post under Why Comics: Perfect Sequences and then get back to me with your ear-chewing. Nagashima can show the beauty of everyday existence on a comic book page. That resonates with everyone. I, personally, have never been drug-addled and sexually depraved and living in a loft in Haight-Ashbury. I love Crumb, but discussions of his work will be limited to his stylistic inking innovations. You could learn everything I have to teach by just getting a copy the complete Fuuten and drinking in every page. Let’s focus on one aspect. 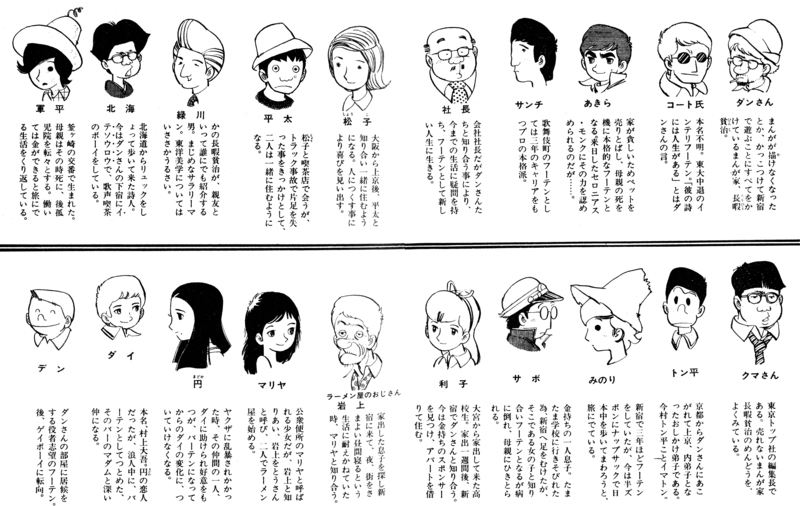 Nagashima finds a way, within the constraints of his chosen “simplistic” style, to distinguish every character in his huge cast of characters. This is done with every trick we’ve discussed: accessories (hats, sunglasses), hairstyles, and brilliant cartooning: look at the shapes of all those heads! You are not at a loss for a moment in the tale for who is who. More than that, despite the few lines used, the characters do not read just as types. That would ruin a realistic yarn such as this, which is perhaps best compared to “On the Road,” minus the drugs, plus plot lines. These characters cannot become ciphers for the story to function. They must seem like real, individuated Japanese people, each with real problems and true loves. And they do.